I like the fact that it is lighter than my Dior one, which makes it more wearable during this wintery season. With the other one it looks like I just came back from the bahamas. I already have the big one, and I love it, so it is pretty cool to carry in the handbag or in the carry on. I tried it on and it is easy to apply and difficult to remove. I do not use liners, so this one is going to a friend. It smells like oranges...it made my hair really greasy and stinky. I love getting things in the post (Graze boxes are my weakness...) but I've hitherto managed to resist the urge of signing up to a beauty box! Hurrah! Love Clarins's Products!! I I want to try this! i really love this box, it has many things! I love surprises! great one! ohh thanks for showing us the insides! i've always think about signing up for glossybox because i love trying out new beauty samples.. but i love seeing what other ppl get inside to help me make a decision if i should sign up or not. the box is so pretty! Great post...would love to order one for myself and get the feeling of excitement to see what all I'll get :D...I would love to try out the Clarins Hydraquench cream <3...thanks for visiting us and we are following you right away..would be great if you can do the same ...Fab week Ahead!!! Wowwww so many great products!! Great blog filled with many ideas. 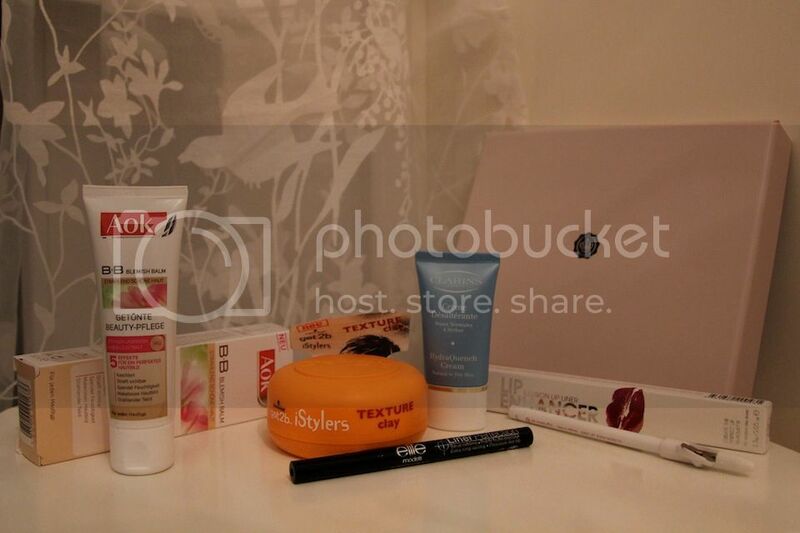 The products in this glossy box look really good! Looks like a really great box...the lip enhancer does sound quite interesting, please let us know how it worked!I need to try the Clarins cream. P.S the issue of missing images also happened to me a few times, I had to reload them. I love glossybox! Interesting products, I would love to try that lip enchancer. I like how through this review is and that you find people who will use what you do not. I love this kind of boxes!! Plz check you follow or tell me what is your name in GFC because I cant see you!! :)! !Visit http://urbanfashionstylee.blogspot.com and check my new post!! I love thata glossy box! amazing products! Thanks for all of your nice comments and following my blog x Big kisses! La caja está muy bien, pero lo que me ha enamorado han sido tus cortinas!!! Ooh la la! Pretty things! Good stuff! Especially the Clarins cream. 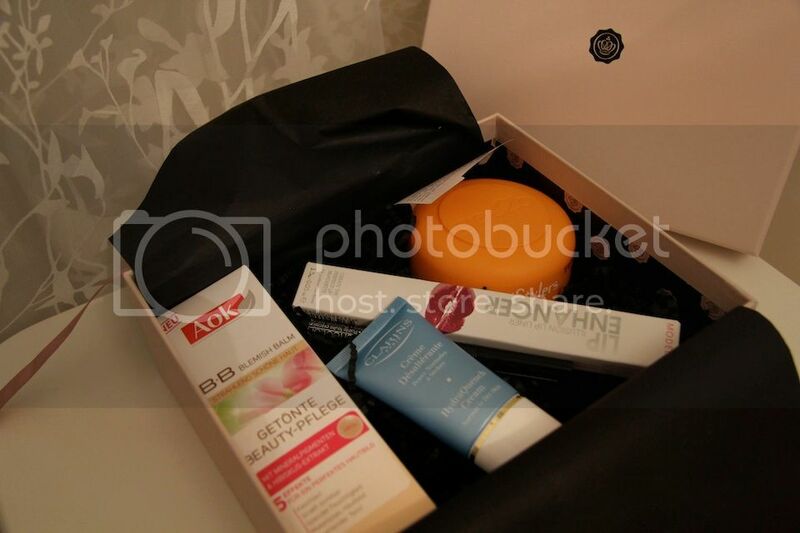 I like Aouk too and Clarins is perfect brand. Have a great day. um...the Schwarzkopf got2b Texture clay doesn't sound so good. Happy to know its icky! I really want to do one of these. It seems so fun to get a present once a month in the mail. :) Thanks for your honest review on the contents! Glossybox sounds so cool to me! Hahahaha yay for the Beauty Box time of the month! A very interesting assortment of products. Hair clay might be more suited for styling very short hair I think. P.S. Locks of Love is awesome! From your description they must be great products!